This extraordinary and Special Ham deserves its own space. 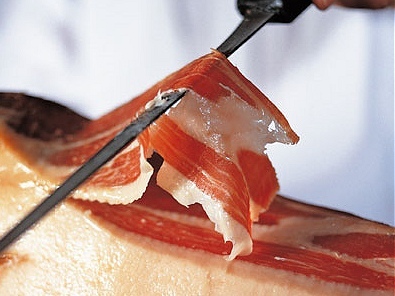 The Iberian Acorn Ham it's exclusive from Spain. Iberian hogs are born, fed and raised in the south and northwest of Spain. These facts, among others, like the environmental and the acorn diet, make these hogs breed so special, their ham so tasteful and the recipes so exquisite! Since I first tried it, many years ago, I'm addicted to eat/it!!! If you ever come to Spain and want to buy some in a specialized shop or buy it through internet you should ask for the advise of an expertise or go to a recommended grocer's/gourmet shop because you might disagree in the quality/price you pay. It should be eaten at room temperature, never cold. Open a bottle of good wine, relax and enjoy its flavors! Slice the onions and put in a pot with the olive oil and sugar. Cook at low fire for 1 hour (microwave 15 minutes). Cover the pot. Add the wine and cook for another hour without the cover at low fire (if you do this part the day before, flavors will stand out). Toast the bread and spread the mixture on it. Lay one slice of Jamon Iberico on top. Prepare a pan at high fire and when it's very hot cook only for 30 seconds each side of the duck foie. Lay it on top of the Iberian acorn ham and pour some kitchen salt on it. You've never tried anything like this!!! !